A Passion for Leadership: Lessons on Change and Reform from Fifty Years of Public Service. Robert M. Gates. New York, NY: Alfred A. Knopf, 2016. Leading change is one of the most difficult tasks a leader can undertake as the head of an organization. Organizations don’t survive over the long-term if they do not change to meet the challenges of the environment they are operating in. Often the biggest opponents to change are the members of the organizations themselves. As Kotter writes in “Leading Change, Why Transformation Efforts Fail,” “Sometimes executives underestimate how hard it can be to drive people out of their comfort zones.” And change starts with vision. When a leader shares a vision, he or she is talking about change. Truly visionary leaders challenge the way things have been done. They create unique ways to provide remarkable service, take thoughtful risks, and proactively implement new ideas. They implement change and move the organization forward. While some members of the organization will embrace the change, others will not. To navigate change the leader needs the support of key subordinate leaders in the organization. He or she needs a champion at all levels with the ability to see it through. 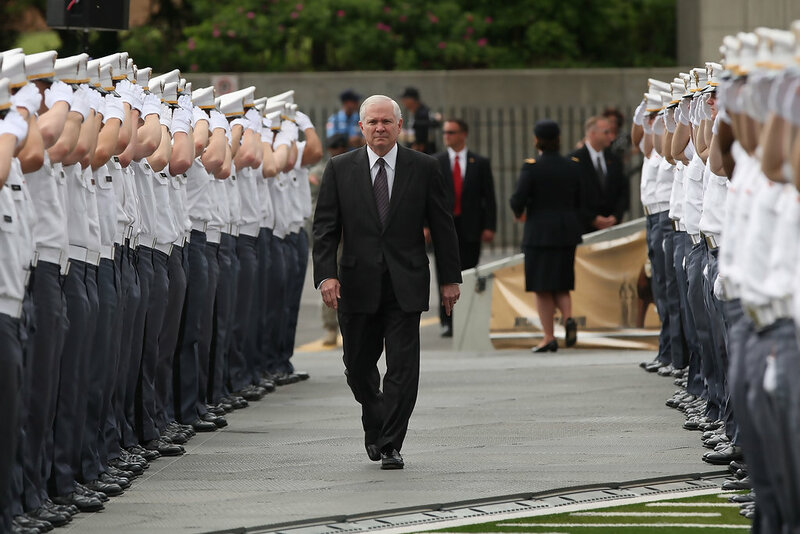 In A Passion for Leadership, Robert Gates shares his experiences leading three major bureaucracies: the Central Intelligence Agency, Texas A&M University, and the Department of Defense. A major strength of the book is how his insights are woven together through the sharing of his experiences, demonstrating an approach to organizational change that closely follows Kotter’s model. While Gates offers insights for both seasoned and new leaders, we all read and view situations through the lens of our experiences, however. I read this book through the lens of an Army company grade leader, and that provides the context on which my observations are based. “Core to leadership is the ability to relate to people –to empathize, understand, inspire, and motivate"
Gates defines a leader as “one who guides, one who shows the way.” His definition emphasizes the need for a clear, compelling vision that the leader fully embraces. He highlights that the senior leader is the one who knows the way and will build the team that will lead the organization toward that accomplishing their vision.He emphasizes that leadership styles will vary but the personal qualities to effectively lead change require leaders to lead with humility, empower subordinates, and be to be strong and confident enough to stay in the background focused on getting the job done,and not on their personal glorification. This is aligned with Kotter’s organizational change framework, in which step 2, Forming a Powerful Enough Guiding Coalition, highlights the importance of leveraging relationships. He emphasizes the leader leading the change initiative has to assemble a group with enough power to lead the change effort and encouraging the group to work together as a team. Gates emphasizes that leadership styles will vary but the personal qualities to effectively lead change require leaders to lead with humility, empower subordinates, and be to be strong and confident enough to stay in the background focused on getting the job done,and not on their personal glorification. In his organizational change framework, Kotter writes that it can take several years for change to take effect in organizations. “Until changes sink deeply into a company’s culture, a process that can take five to ten years, new approaches are fragile and subject to regression.” Gates emphasizes the need for the leader to understand how much time they will have to implement change sharing. “As DCI, with a U.S. presidential election coming in less than a year, I didn’t know whether I had one or five years to implement change, so that uncertainty was part of my need for speed.” In my experience in the military, commanders have 12-24 months to lead their organizations, not the numerous years Kotter describes in his change framework. Knowing how much time is available will prioritize the agenda where change will be initiated, as well as determine the speed of change that is appropriate. Gates writes that leaders must not waste time fighting the reality of the organization because they arrive with a preconceived plan or goals that led in another direction. To initiate change requires exercising leadership and Gates emphasizes that leaders focused on bringing change, “must find a way to break up the bureaucratic concrete and create the opportunity to develop new thinking and approaches.” He highlights the importance of getting out of the office and doing listening tours to learn about and gain an understanding of the organization. This is also an effective way to build relationships that can be leveraged in the future to make progress on change initiatives. The diversity of the group's Gates formed brought different perspectives to the table, and the short suspenses helped demonstrate “seriousness of purpose” to the organization. The task forces and councils helped ensure organization-wide collaboration,identified problems, and offered solutions. Gates cautions leaders, advising if they are truly seeking reform they will direct their taskforces and working groups to seek bold ideas and not just settle for consensus. As Gates shares “courage is essential for reform.” It takes courage not to compromise on ideas that maintain the staus quo, and to offer ideas that can lead to breakthrough solutions. Toward the end of the book, Gates offers some excellent advice on when to consider exiting the organization. Leaders have to be honest with themselves that they have done all they can to reform or change the organization, they have made their contribution and it is time to go. This demonstrates a self-awareness for which all leaders should strive. 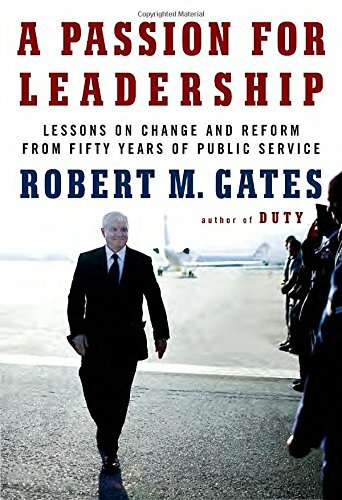 As Gates shares, having that awareness, the ability to look inward and understand whether they want to stay for “noble or ignoble purposes.” This book presents a great opportunity for leaders to reflect on their career, and can help guide leaders on when is the proper time to exit an organization, or a profession like military. This book is an excellent addition to the wide body of leadership literature. Leaders are developed, in part, through experience, and through the lens of Gates’ experiences A Passion for Leadership takes a practical look at leadership and the application of it in the context of organizational change. It is a book both new and seasoned leaders should read as a companion to more theoretical pieces on organizational change. Jonathan Silk is a retired Army officer and a former faculty member at the United States Military Academy, West Point, NY. Jonathan is currently the Executive Director of Leadership Development at the University of North Texas Health Science Center. He is a doctoral student in The Pepperdine Organizational Leadership program. He is a graduate of the Columbia University Executive Coaching Certification Program and holds an MBA from the University of Texas (Dallas). Gates, Robert M. (2016) A Passion for Leadership. New York, NY: Knopf, 24. Kotter, John P. (2006) “Leading Change: Why Transformation Efforts Fail,” Harvard Business Review and “The Tests Of A Leader,” Harvard Business Review, January 2007.